For the past twenty-plus years, The Martha Stewart Empire (not its real name, of course, but who doesn’t think of it that way? )—led by their taupe pant-suited leader—has dutifully monitored the cult of domesticity. The media has gleefully followed Martha’s ups and downs. With recent news of major financial blunders, Martha Stewart may be down, but don’t count her out. In late November, The New York Times ran a story claiming that Stewart “has emerged as something of a patron saint for entrepreneurial hipsters” and that Martha Stewart Living has become, in the words of its editor-in-chief Pilar Guzman, “the intersection between Colonial Williamsburg and Williamsburg, Brooklyn.” According to the Times—and the slew of media outlets that followed suit—Martha Stewart is enjoying a renaissance of popularity among the young and au courant. The fact is, Martha Stewart isn’t suddenly hip. While it may be true that twenty- and thirty-somethings are discovering the allure of Doyenne of Domesticity for the first time, to imply that hipsters have “adopted” Stewart as a newfound idol misses the point. In fact, Stewart was the first major figure to make homekeeping cool, albeit inadvertently. She embraced home-grown, DIY culture long before it invaded the mainstream and trumpeted small, local brands from the outset of her career (she herself started as an independent caterer). Martha isn’t influencing hipster culture; she created it. Martha seems newly hip because the metric for coolness—historically unrelated to the domestic arts—now directly corresponds to the idea of an “authentic” home. Homekeeping, once the domain of housewives or ladies who lunch, now belongs to the hipster—a dedicated keeper of hearth and home, a slow-cooking, hand-crafting, park-foraging, rooftop-gardening 1950s housewife pastiche (plus a little liberation, one hopes). In an earnest attempt to move away from frenetic, market-based modernity, hipsters have embraced an ethos of self-reliance. Slow, thoughtful assemblage and a dedication to product origins are their mantra. Cooking is all about fresh, organic, local ingredients, preferably grown on a local apartment rooftop or in a community garden. Decorating is always a mix of the “high” and the “low”—doctored Ikea coffee tables mixed with vintage chandeliers and mid-century modern sideboards. Hipsters strive, most importantly, to do everything in their own homes and with their own hands—a DIY mindset is firmly embedded in their culture. No one deserves more credit for the idea that DIY homemaking can lead to happiness than Martha. As a young girl, Martha’s mother had taught her to bake and sew, and at her grandparents’ home, Martha also learned canning and preserving. 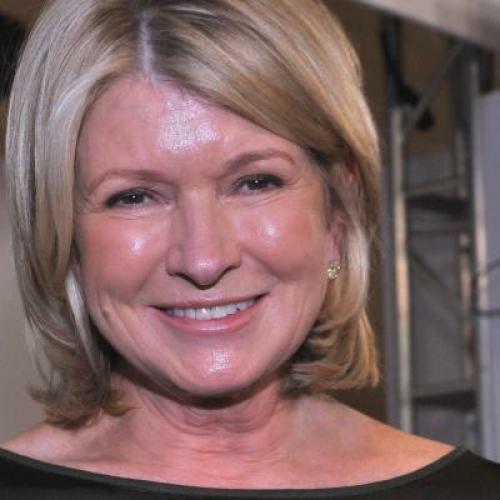 The 1980s saw Martha married and successfully running a catering company, which in turn led to the production of the Martha Stewart cooking and entertaining books. But it wasn’t until after her 1989 divorce that Martha turned those childhood experiences into adult success with the 1990 launch of Martha Stewart Living. More than anything she’d done before, Living conveyed the idea that homekeeping could be an art that married practicality and pleasure—the pursuit of beauty in everyday life. Every event, Martha intones, from the after-school snack to the wedding of your firstborn child, can be an opportunity for simple elegance. Practical objects need not be plastically garish to be functional. Edibles can delight the eyes and the palette. Most importantly, your home is a sanctuary and should be treated with due reverence. What’s more, Martha made crafting and homekeeping fun, accessible, and mainstream. Martha’s preferred method of inspiration is instruction. Her projects may be complicated, but they are ultimately relatable—if you follow along, you can recreate Martha’s ideas at home. The magazine even provides a “workbook” at the end of each issue, laden with “how-to” lists. On Martha’s website, video tutorials instruct in the art of flambé-baking, and printable checklists guide readers how to thoroughly spring-clean draperies. The Martha Stewart world engages in a highly sophisticated form of posh practicality. While The New York Times tried to make news of the Martha-hipster convergence, it has for a long time been evident. Look no further than the ranks of the successful homemaker-turned-blogger-turned-internet-design-gurus of the moment, whose websites and collaborations both mirror and inspire hipster creativity. There’s Grace Bonney of Design Sponge, a Brooklyn-based design writer and decorator whose followers number in the hundreds of thousands; she’s been blogging since 2004 and now instructs younger bloggers with her “Biz Ladies” series. Lisa Congdon—an artist and illustrator, whose Collection A Daywebsite featured an almost embarrassingly voluminous collection of vintage ephemera, such as Edwardian calling cards, fake leaves, and wooden clothespins—started the project on the first day of 2010 and sells prints through the highly-visible 20x200 online art shop. Women like Bonney and Congdon have taken their projects professional—just like Martha did—and have created such reputable brands that publishing houses and established product lines have come calling. In the last year alone, three domestic-art-oriented bloggers—Grace Bonney, Maxwell Gillingham-Ryan of Apartment Therapy, and Holly Becker of decor8—all released home design coffee table books, complete with speaking tours and reviews in major national newspapers. (And this was the third book for Ryan and second for Becker.) The editors of online design magazine Rue posed in Gap ads. Style bloggers Camille Styles and Emily Schuman launched partnerships with mega-brand Coach, and Victoria Smith, the crafty and beloved SFGirlbyBay, was featured in West Elm’s March catalog, showing off her favorite products. These are not the accomplishments of a recent burst of Martha-inspiration, but the manifestation of years of dedication and creative work. In short, the ethos of hands-on, authentic home-making is not new. Martha and today’s hipsters share an aspiration to deal with commodities that are fresh, handcrafted, and built to last. With every well-publicized step these newer brands take, they mold themselves further in Martha’s image. Martha may personally favor tucked-in silk to unbuttoned flannel and linden allée to fire escape gardens, but her legacy is nonetheless the touchstone for today’s crop of domestically savvy youngsters—and tomorrow’s.